Filling and delicious. No animals were harmed in its production. There’s two words floating around for essentially the same dish: ragù and ragoût. To complicate matters there’s a company called Ragú® that makes pasta sauces. Note the difference in how the accent on the “u” is placed. I imagine they tried to brand mark the original spelling and someone said “no, no – can’t do that.” That was in the late 1930s. I bet today the could. You cannot tell me those slices don't look good. So what is the difference? Well first off, one is Italian and one is French. But both refer to a main dish stew that is cooked for a long time on low heat. The Italian “ragù” is a meat-based sauce. 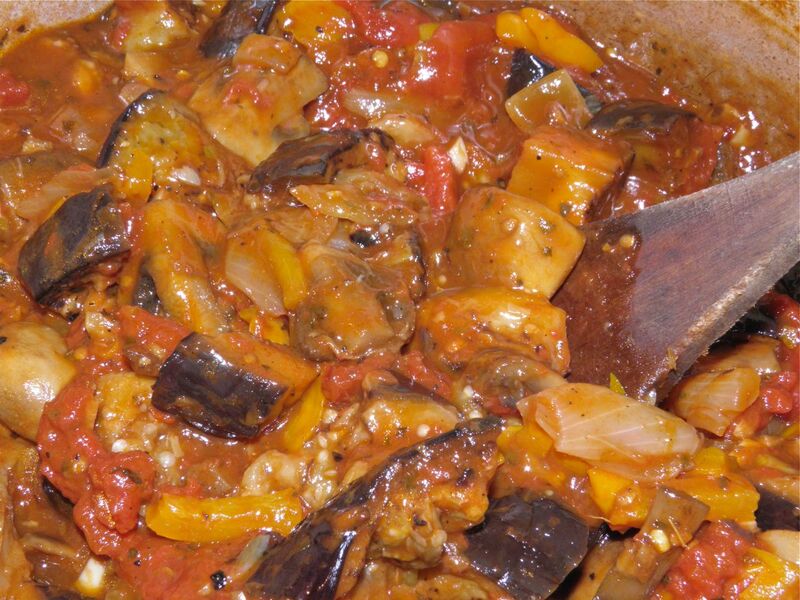 The l'Accademia Italiana Della Cucina has stated there are14 specific ragù recipes. Italian ragùs always contain meat. The meat can be almost anything including poultry, beef, pork, lamb, game and even offal – or mixtures of any of those. Cooking liquids range from bright, wine, water, cream and tomato. The difference between tomato sauce with meat and ragù is that the tomato is far less present in the latter. A benefit of ragù is that since it is simmered a long time less expensive cuts of meat can be used. The long cooking time breaks down the tougher cuts. This is doubly true when an acid, like tomato juice or wine, is added. The French ragoût (or ragout) is exactly the same – except it can also be made without any meat at all. A very wide varieties of vegetables can be used. Italian ragù always has meat. then so it doesn't disappear completely. The term comes from the French ragoûter, which means "to revive the taste". I’m not sure what they’re reviving – if it has to do with the dish itself or the person eating it. I was in need of a little reviving myself yesterday. We were blessed with a snowstorm yesterday and something hearty was in order. Luckily accumulation wasn’t nearly as much as predicted, but before yesterday we had no snow on the ground. If you’re looking for a meat substitute that isn’t tofu, the next best “go to” is eggplant. 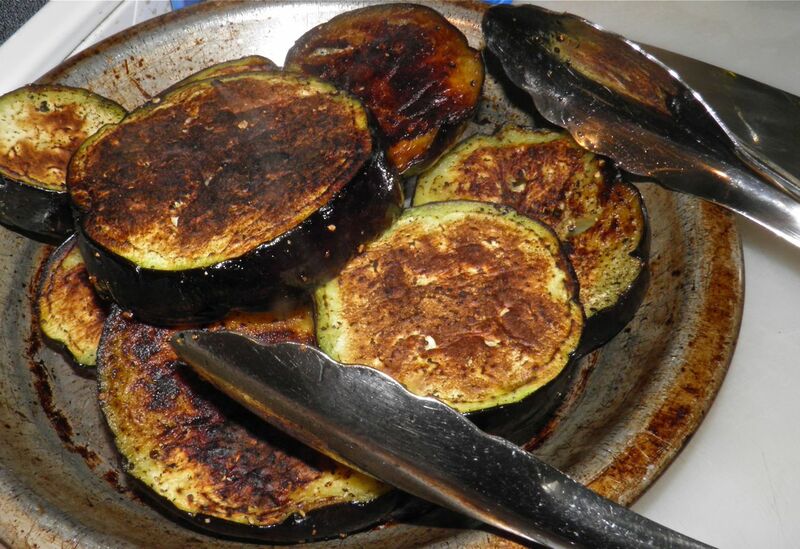 Eggplant is rich and smoky tasting when fried. Couple those with earthy mushrooms and you’re well on your way to a deep and delicious meal. Between you and me, I never salt my slices of eggplant before using. The reason recipes call for salting (known as “degorging”) is to exude “bitter” liquid. I don’t find eggplant particularly bitter. The bitterness is actually caused by the presence of phytonutrients that help fight free-radicals. Eggplant parmigiana is another great recipe using that undervalued vegetable – and simple too. I have a good one here. 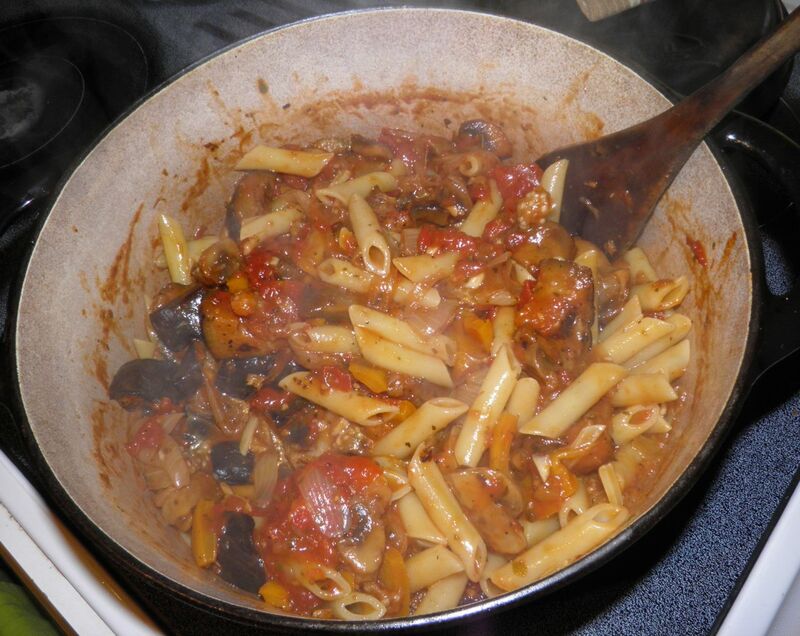 If you do have the two hours to let a pot simmer on the stove, you should give this a try. It’s quite filling and makes a lot. I usually toss my pasta directly with the sauce. That way any leftovers can be portioned out into individual dishes and taken for fast and tasty lunches. Heat some of the oil in a heavy bottomed pot, like a Dutch oven. Slice the eggplant into 1” thick slices. Fry the slices in the hot oil until nicely browned. Add oil as needed. Remove to a plate. Quarter the mushrooms. Cut the onion into eighths. Fry until the mushrooms start to exude their liquid. Add the garlic and fry for a few minutes until fragrant. Add the wine, tomatoes, oregano, basil, pepper and about 1/2 tsp of salt. Bring to a boil, partially cover and simmer for 1-1/2 hours. 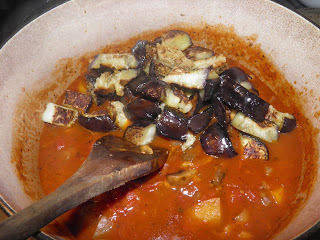 Cube the fried eggplant and add to the sauce. Let cook for an additional 20-30 minutes. Taste for salt and adjust. 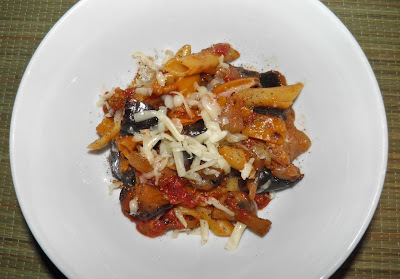 Since this is a chunky sauce serve over penne, cavitappi, fusilli or other short pasta. Or toss warm pasta directly with the sauce. Serve with grated cheese on top. For a different taste I used oka cheese.